Scientology was a logical product of post-World War II America. In a society flush with an extraordinary military victory and enjoying an unprecedented economic prosperity, it seemed inconceivable to anyone that there could be any excuse for not being prosperous and happy. It was not unreasonable then for people to look for the solutions to their problems inside themselves. Psychoanalysis enjoyed its greatest popularity in the U.S. during this period. Scientology, with its roots in pulp fiction (Hubbard was sometimes called the “King of the Pulps”), was a sort of pop culture Freudianism, albeit with religious overtones that were understandable to Americans who had been exposed to evangelical Christianity. Paul Thomas Anderson’s new film has a character who is obviously modeled after L. Ron Hubbard, although Anderson insists that the film is not actually about Scientology. Fred Qwell (Joaquin Phoezix) is a World War II veteran who suffers from Post-Traumatic Stress Disorder. (In those days, it was called “combat fatigue”.) He is severely alcoholic, and he is unable to hold down a job. One night, hungry and desperate, he stows away aboard a yacht on which a party is taking place. When people on the yacht discover him, they treat him kindly. They take him to the yacht’s “commander”, Lancaster Dodd (Philip Seymour Hoffman). Dodd takes a liking to Qwell, and he begins to treat Qwell as though he were another one of his guests. We learn that Dodd is the leader of a movement known as The Cause. He has developed a form of analysis that he believes can make people achieve happiness and ultimately solve all of mankind’s problems It becomes clear to the viewer that Dodd is suffering from megalomania, but Qwell finds him charming, likable, and impressive. Dodd uses Qwell as a test-subject for his theories. Qwell develops a strong emotional attachment to Dodd, so much so that he sometimes physically assaults people who criticize “The Master”. The film subtly suggests that Dodd, for his part, develops a psychic dependence on the fiercely loyal Qwell. 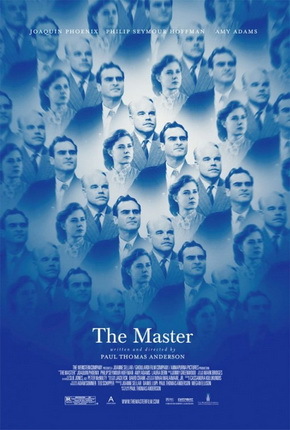 When I went to see The Master, I was under the impression that it was going to be mainly about Dodd. The advertising seems to indicate that. In fact, it turns out to be essentially about Qwell and his efforts to make sense out of the world. I’m afraid some people may find it disappointing for that reason. However, I found it fascinating to watch and emotionally compelling. Hoffman’s performance is amazing. This is the best American film I have seen so far this year.